The Township was first organized as the Town of Kent in 1834 with Rix Robinson as the moderator. The State of Michigan designated Grand Rapids Township in 1842. The Township is primarily single-family residential community with several condominium developments and a small mobile home park. There are four retirement homes, two nursing homes, a private hospital, YMCA, Frederik Meijer Gardens, several office parks and neighborhood commercial areas. The Reformed Bible College and seven churches are also located within its borders. Grand Rapids Charter Township has three school districts: Forest Hills, Northview and East Grand Rapids. The Fredrick Meijer Gardens is a wonderful place to visit for the whole family! 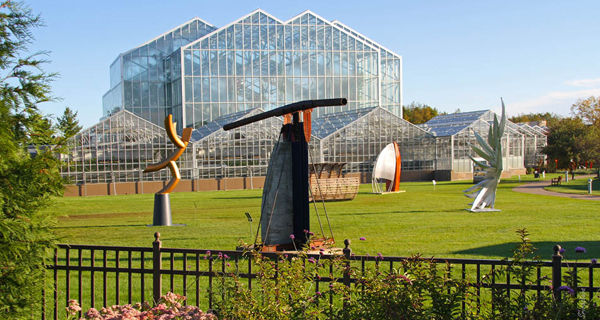 Discover the beauty and splendor of the botanic garden and internationally acclaimed sculpture park. Comprised of 132 acres of natural wetlands, woodlands, meadows and display gardens, Frederik Meijer Gardens & Sculpture Park is a year-round experience with indoor tropical, arid, carnivorous, Victorian and seasonal gardens, changing sculpture galleries with exhibitions by international artists, and outdoor acreage featuring an internationally acclaimed Sculpture Park, Children’s Garden, Michigan’s Farm Garden, amphitheater for summer concert events, nature trails and boardwalks. Recently ranked in the top 100 most-visited art museums worldwide by Art Newspaper, the leading publication in global art news, Frederik Meijer Gardens & Sculpture Park has grown to become an international destination. The Township Hall Park on the East Beltline that comprises 58 acres with three ball fields, soccer field, sand volley ball, three tennis courts, basketball hoops, handicap accessible playground and nature trails that can be used for cross country skiing in the winter. There are indoor pools and other facilities at the Forest Hills Aquatic Center and YMCA in the Township. The Kent County Park System also has the 45-acre Provin Trails nature park on 4 Mile along with the 80-acre Knapp Forest Preserve. Grand Rapids Township is in the process of adding the 120-acre Doezema Farm as a nature preserve and interpretive center.